Louisa Fairclough’s practices of drawing, sound and image installation come vibrantly together in her first solo show at Danielle Arnaud. Ambitious, lyrical and rigorous this body of work rises to the responsibility of the elegy. Bore Song 2011 is a 26 second / 16 foot film loop that runs from the ceiling to the projector on the floor. Framed by water, a young woman stands at the edge of the river. As the tidal wave reaches her, she opens her mouth to sing turning away as the wave pulls across the water’s surface swallowing the reflection. 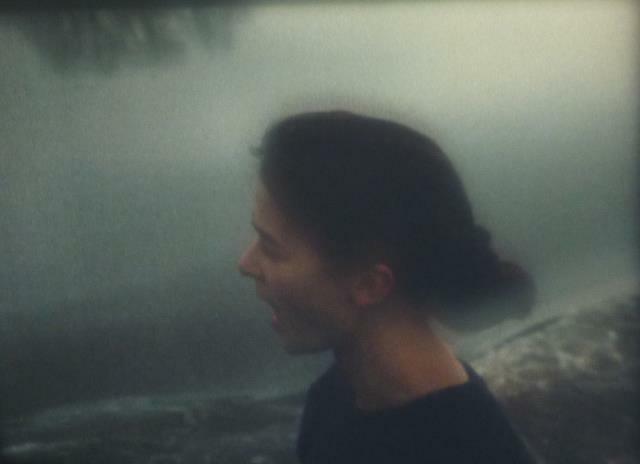 Her voice that emanates from the body of the film projector holds a single piercing note that rises over the sound of the wave. In Song of Grief 2011, Fairclough runs two 16mm projectors opposite each other. An empty frame is projected by both onto their opposite walls and each emits the same pitched note at different intervals. As Cherry Smyth writes: ‘The 16mm film itself catches the light, quivers, as if trying to measure the height, depth, and width of grief itself – something digital sound and projection could not attempt.’ She also writes: ‘Unresolved, unresolvable, this arduous, staggering blast of a work invents a sculptural space for grief to do its exhaustive and exhausting work.’ Fairclough has worked with actress Nancy Trotter Landry and sound recordists Christine Felce and George Richards on this series of sound and film installations. 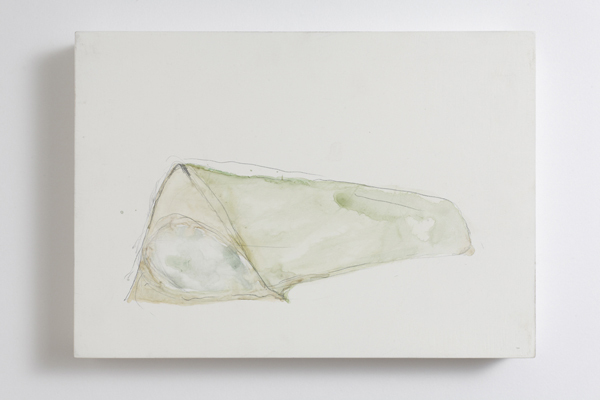 Fairclough’s drawings made quickly and intuitively, use pencil, spit and watercolour, (two of which have been selected for the Jerwood Drawing Prize 2011). They correspond to the cycle journeys that the artist made to the River Severn and the nights that she spent sleeping on the river banks. 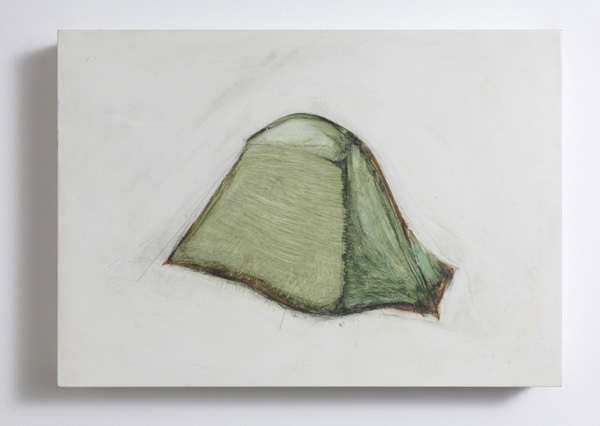 They are of tents, bivvy bags, sleeping bags or stuff bags and act as a softly creeping calendar of grief. 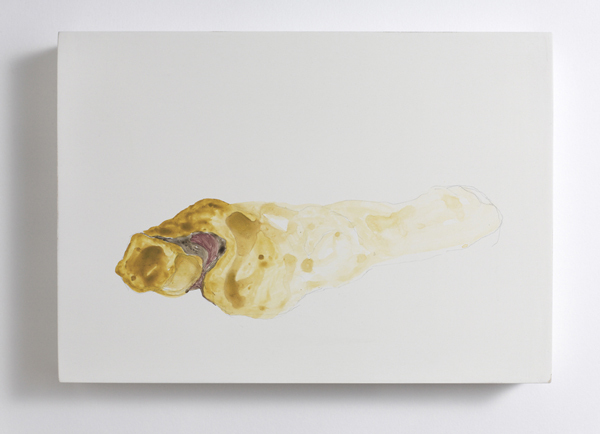 Louisa Fairclough was born in 1972, and lives and works near Stroud in Gloucestershire. She studied at the Slade School of Fine Art graduating in 2000. Shows include the sound installation Song of Grief made during a residency at Meantime Project Space, Cheltenham (2011) and Sleeping on the Severn selected by Tom Trevor for the Darbyshire Award Show, Stroud (2010); Super 8 Station at the Arnolfini, Bristol (2010), New Work UK: The Sensible Stage at the Whitechapel Gallery, London (2008); Meet, a four-screen film installation commissioned by Picture This and shown at ROOM, Bristol and Bath Film Festival (2006). Awards: UK Film Council, Elephant Trust and Arts Council funding (2006/7); The Sugarhouse Studio Residency awarded by ACME Studios (2002), Boise Travel Scholarship (2002), Prospects 2001 London Regional Winner selected by Sacha Craddock (2001), Slade Duveen Travel Award (2001), ACAVA First Base Studio Award (2000). 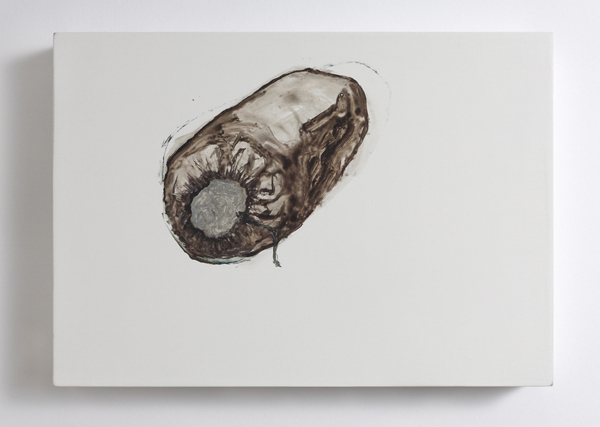 A catalogue with a commissioned text by Cherry Smyth accompanies this exhibition.